Owner Ben Lenda loves driving and fishing his 26-foot Glacier Bay 260 Canyon Runner, a twin-outboard, center console displacement power cat. The day of fishing starts at 6 a.m. Ben Lenda and his compatriots gather at the dock, hop on the boat, and head out of the Narragansett, R.I., marina to chase down some summer flounder and maybe a few stripers or blues. For Ben Lenda, life doesn’t get much better than fishing with friends on his Glacier Bay 260. For some, life doesn’t get much better. Part of Lenda’s fun comes from driving and fishing the 6-year-old boat he bought just a year ago. 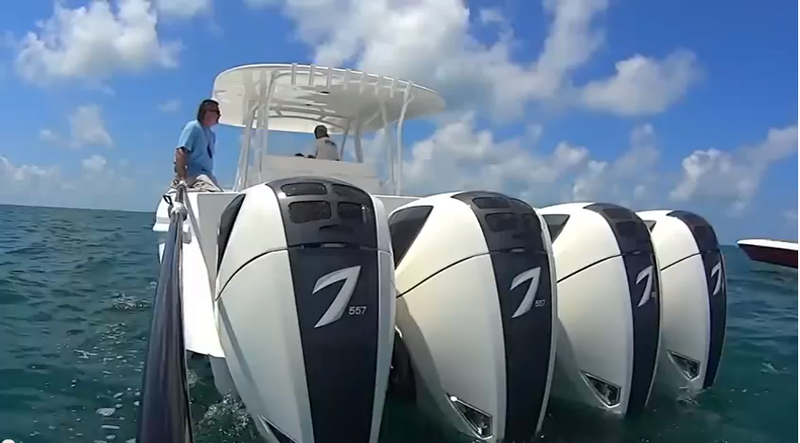 It’s the 26-foot Glacier Bay 260 Canyon Runner (also known as the 2665 Canyon Runner), a twin-outboard, center console displacement power cat that Lenda tracked down after a thorough search and bought for $55,000. 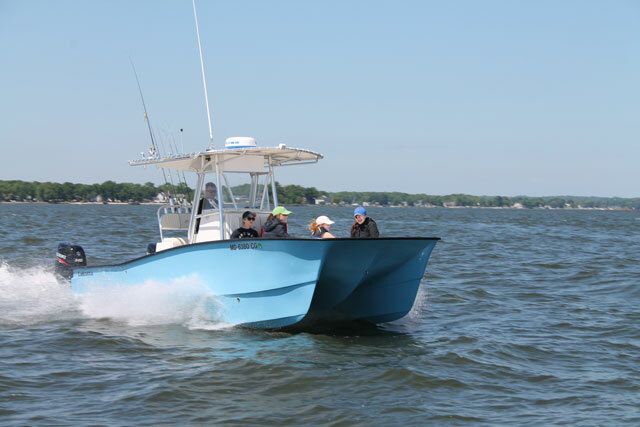 Owner Ben Lenda says the Glacier Bay 260 is a great fishing boat. None of that would matter if the Glacier Bay wasn’t a good fishing boat, and for Lenda, the Canyon Runner fills the bill. “It has an enormous forward deck, which makes a great casting platform,” he says. 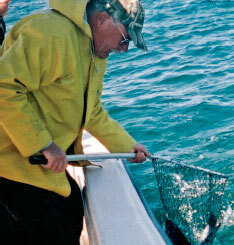 “It’s raised up, and you can stand there and cast for bonita or albacore with plenty of room. We use the afterdeck for trolling.” The layout includes a bench seat ahead of the console, a leaning post, two fishboxes and a large live well. Lenda admits he hasn’t gone too far offshore in the Canyon Runner — yet. Glacier Bay’s 26-foot Canyon Runner rides a pair of displacement hulls made of foam core/fiberglass sandwich, reinforced below the waterline. Hardware is stainless steel and chromed bronze. The profile shows a straight sheer from bow to stern, ending in downturned “wings” that extend to the integral transom platform. 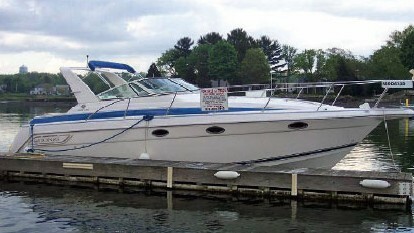 The center console is placed just forward of amidships and includes a two-person leaning post. 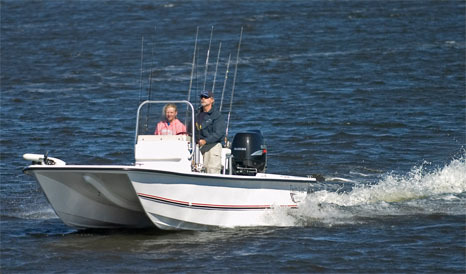 The standard layout and equipment list offer a number of basic fishing, convenience and safety features. 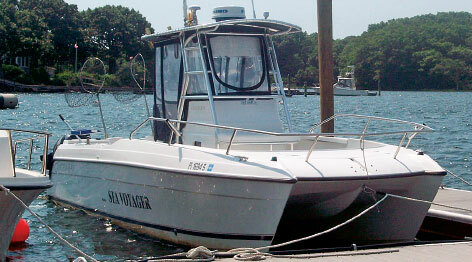 The self-bailing cockpit (lined with cushioned coaming) has insulated fishboxes to port and starboard. The live well is set up abaft the helm seat. There’s also a 13-gallon freshwater system and a saltwater washdown. 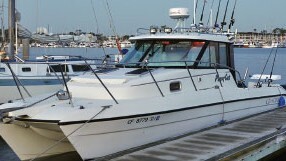 The boat includes a forward console seat, a Porta-Potti in the console, stainless steel bow rail and locking security cover at the helm. Options include a choice of Cobalt blue or Fighting Lady yellow hull colors, a swim platform and ladder, bow pulpit with roller and electric windlass, marine head, and Ttop with rocket launchers. A removable stern seat also is available. 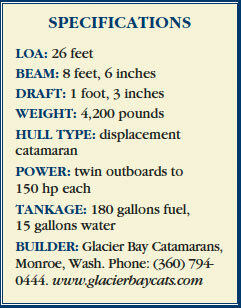 There are plenty of Glacier Bay Canyon Runners on the used market, and prices range from less than $40,000 to around $70,000, depending on the boat’s location, gear and general condition. A “like new” dry-stored 1999 model in North Carolina was for sale online for $39,900, with twin 150-hp outboards, T-top with curtains, bow dodger, swim platform and transom shower. Another 1999 boat — “second owner … excellent condition” — in Texas was priced at $65,000 and included radar, a GPS/plotter, fish/depth finder, freshwater washdown, float-on trailer, stereo system, and a pair of 150-hp, 4-stroke outboards. A “loaded” 2001 boat in Florida was listed at $59,000 and included twin 130-hp outboards, a T-top, swim platform, ice chest console seat, downriggers, 40-gallon live well, 21 rod holders, and a trailer. 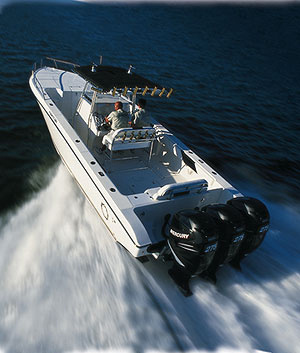 There was a 2004 model in Louisiana selling for $69,000, including a trailer, new depth/fishfinder, a GPS/plotter, VHF, and twin 150-hp outboards with less than 1,000 hours. Steve Knauth is a contributing writer for Soundings Magazine. This article originally appeared in the October 2007 issue.